Promotional USB flash drive is a memory stick that transfers data fast to a handy size which fits on a keyring. The Promotional USB flash drive, Memory stick or Pen Drives as they are often known are common place in many homes and offices around the world. They enable the user to quickly transfer data between two PCs. 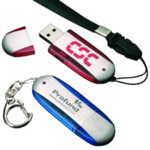 USB flash memory can be personalised with your company logo and details for a great business gift. So why not advertise your business details on our Promotional USB flash drive today! Contact us for a Promotional USB flash drive price or sample on 01989 565281.